Providing you the best range of rubberised ground sheets - lightweight and mk xii and ground sheets with effective & timely delivery. We manufacture ground sheets made of double texture rubberised fabrics as per JSS 8305 and JSS 7210. This is supplied to various state police departments, RPF, and paramilitary forces such as CRPF, BSF, ITBP, SSB, Assam Rifles. 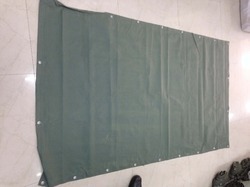 Our range of Ground Sheets offered to our clients is basically used by Defence, Paramilitary and Police forces. These are available in various size and is comfortable to sit as well as wrap. The ground sheet is made using quality fabrics and is duly tested for quality so as to protect the skin from rashness and other allergies. The ground sheets are available at reasonable price and are widely demanded by our national and international clients. The common sizes are 42" x 75" with 22 aluminium eyelets. However, we have undertaken orders of various sizes. Looking for Ground Sheets ?